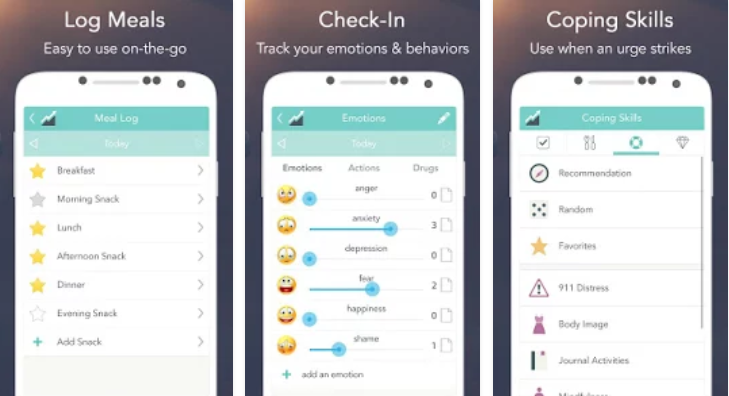 Rise Up is a mobile app designed for people dealing with eating disorders. The app’s main feature consists of mood and meal logs. When users enter the program, they are directed to “check in” and rate their daily mood from a customizable list. Then, they can log a meal in a detailed log (e.g., time, food consumed, location, mood, and problematic eating behaviors within the meal context). Once a meal is logged, it can be exported as a PDF version via email. Users are rewarded with an inspirational message for logging a meal (e.g., every human being is the author of his own health and disease). The program also offers tips related to the recovery process and effort, divided into various themes (e.g., body image, journal activities, mindfulness, relationship). Additional features include external links to search for treatment and access a music playlist of recovery music through Spotify, as well as blogs, podcasts, etc. Rise Up provides a suitable solution for users dealing with eating disorders who wish to fill daily meal logs in a quick and convenient way. Logs are easy to export to PDF, which makes it easy to share with clinicians. The inspirational messages are to the point, and the tips lend support to the process. On the downside, the program lacks a general overview of meal logs over time (besides the weekly view via PDF); the mood logs record general daily moods (not hourly) only once per day and do not incorporate an aggregated view of the recorded moods. Furthermore, although the mindfulness tips could potentially benefit Rise Up users, for those inexperienced with mindfulness (in the way targeted) an audio/video guided practice is truly missing. Rise Up could be mostly beneficial as a supplement to ongoing treatment for patients in the recovery process from eating disorders. Clinicians could utilize the PDF report to track the patient’s meal logs and review them during the therapeutic session. Although meal logs are not integrated with patients’ moods, having the information documented in real-time allows clinicians to take a close look at patients’ progress and compliance with therapeutic goals. This enables discussion and adjustments in the subsequent session.